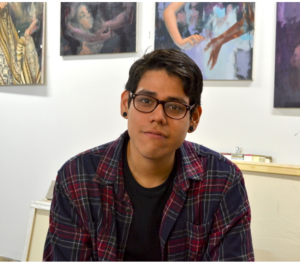 Santiago Galeas is a wildly talented young Latino painter from Philadelphia. In an art world dominated by painting, Santiago’s oil portraits of people of color are truly spectacular and original. It is very exciting to support such a young artist (25) and see where his career will take him. It seems that your residency was incredibly productive. Tell us what you accomplished. It’s okay to brag! I worked on five paintings! I even finished one. That’s actually a lot for me. I have been struggling to balance my day job with my studio practice but the month I spent in Chapala was the most freedom I’ve ever had to do my own work. Normally one painting will take me months. I work very slowly so it was a treat to get so much done. All the work started in Chapala will be included in a solo exhibit at A Seed on Diamond Gallery in Philadelphia, PA this coming August. How did you organize your time while you were here? Readers are often curious about how an artist structures his time. I would go out in the mornings in search of potential portrait models, and I would also explore Chapala or run errands. There was just so much to see: lake, mountains, shops, Malecon, and of course the Mexican people. Afternoons and evenings were good times for working, but I didn’t really stick to a strict schedule. Having the freedom to work at any time was invaluable. You were included in Art Miami this past year. That’s quite a feat for a young, emerging artist. Give us a flavor of your experiences at the biggest art fair in the US. Miami was incredible! The work at Art Miami was very diverse and it was my first time there, so I got to explore the city as well as see the exhibits that were going on. It was impossible to fully experience the art scene in just one weekend and I definitely intend to go back. How does your ethnic and creative background influence the imagery in your paintings? 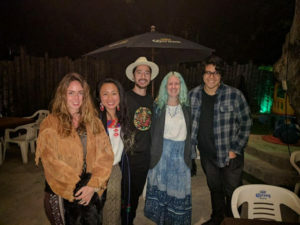 I think being Latino, and especially Peruvian, I feel a responsibility to represent indigenous cultures in the images I worked on while in Mexico. My mother was born in Cusco, Peru and much of her heritage was preserved in my upbringing. It was super useful being able to converse with the Mexican subjects I wanted to work from. I’m fascinated by the endless varieties of Latino diaspora, so being in a location so rich in its ethnically diverse culture was awe-inspiring. My work is largely influenced by an academic training with roots in the French atelier. It’s great being able to portray populations that I wouldn’t normally see in this style. We loved your application portfolio and were moved by your portraits painted in a unique expressionistic style. Talk about your approach and how you choose the people you paint. Who did you paint while you were in Chapala and how did you find models? Thank you! The paintings in this blog post show two locals from Chapala. One was a woman who sold me a blanket at the market along the Malecon. The other is one of the Voladores who do their incredible spinning dance right by the lake. I asked them both if I could take a couple photos of them for a painting and they obliged. It was towards the end of the residency when we took that trip to the villages in Michoacán that I got a ton of references for future paintings. 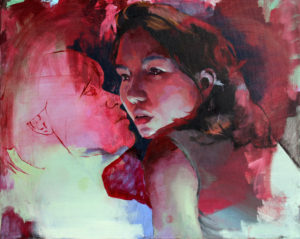 Generally I try to paint people who aren’t often represented in the contemporary painting realm. 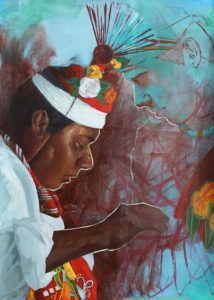 In this case I wanted to paint as much of the indigenous culture as I could while in Mexico. Lake Chapala is a gay retirement mecca . What was your experience here as a gay man? I had no idea! I didn’t really experience much of the gay scene while I was in Chapala because I was painting so much. It’s nice to know that this would be a welcoming community for me and my partner. What were some of the highlights of your residency? The four days we spent in Michoacán were so great for immersion. It was the only time I wasn’t working on paintings but I was taking a ton of reference photos the whole time. I realize it wasn’t a standard experience for the program so it was even more special and I’m grateful for all of the work local photographer Xill Fessenden put into organizing this trip. Also, traveling with the other residents really made the experience very special. I miss them! What could be improved in this residency program? I couldn’t say. I can see the impact that this program has had on my work already and am just thankful to have been a part of it.